Later this year, the Illinois Environmental Protection Agency (IEPA) is likely to decide on a proposal by Dynegy Midwest Generation that would leave 3.3 million cubic yards of coal ash immediately next to the Middle Fork of the Vermilion River, Illinois’ only National Scenic River. Their decision will be made without any public input. We think a determination by a state agency that leaves behind a legacy of toxic waste without hearing from the affected public is unconscionable. If the Illinois EPA will not hold a public forum, Then we will! The concept of incorporating stakeholder input into decision-making for major public actions is not new. It is an essential part of the process outlined by the 1970 National Environmental Policy Act covering significant actions by federal agencies, and is a principle enshrined in the Rio Declaration of 1992. On its most basic level, the principle of public participation holds that those who will be most affected by a significant governmental decision have the right to participate in the decision-making process. The people of Vermilion County and others who use and rely on the river for recreation, tourism and economic development deserve to have their voices heard. Unfortunately, the statutes that will guide the IEPA’s decision-making process do not provide for public participation. The Governor and IEPA have so far declined to hold a hearing, stating that only technical comments related to Dynegy’s groundwater violation can be forwarded to the agency for their consideration. If the IEPA will not hold a public forum on the long-term impacts of the proposal, then we will. And we invite you to join us. It Won’t Stop the Pollution – Capping the coal ash pits will reduce infiltration of rainwater and floodwaters into the ash from above. However, covering the pits will not separate the ash from the groundwater, nor prevent the lateral flow of groundwater through the ash from the west toward the river. The IEPA will review Dynegy’s groundwater modeling after it is completed in June to determine whether a cap will reduce pollution below Class I Groundwater Standards. But Dynegy won’t be required to stop the discharge of coal ash contaminants—just to reduce them to acceptable levels. 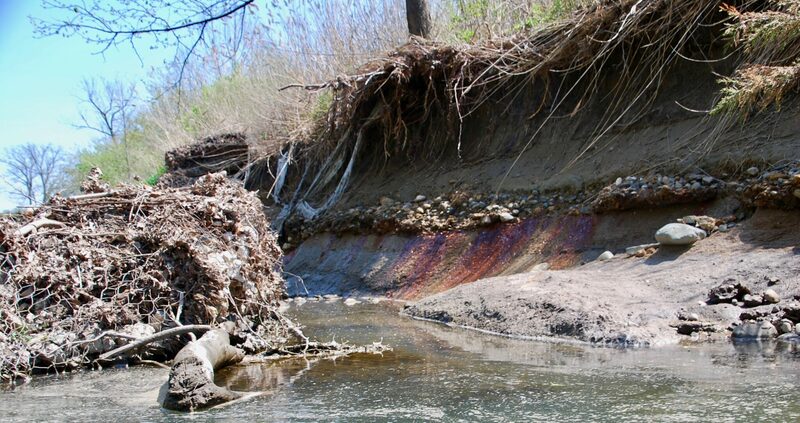 Erosion is Worse than Expected – Riverbank erosion continues to move the river channel toward two impoundments that hold 2.8 million cubic yards of toxic coal ash. A November 2017 report by one of Dynegy’s consultants says erosion is happening at the North and Old East pits at rates that are 2.5 to 9 times greater than previous estimates. According to that report, 775 feet of the 1,700 feet evaluated have already eroded to a point where there no longer is room to accommodate construction equipment required to stabilize the banks. Another 550 feet may be inaccessible due to deteriorating gabions (wire baskets filled with rock) installed by Illinois Power in the 1980s. The natural forces of the river shredded these gabions in just 30 years. Reinforcing the bank will offer some medium-term protection, but it is not likely to permanently stop erosion. This is because the bluffs and topography near the coal plant direct the river toward the ash pits. When the river is at high flow, boulders, downed trees, and ice flows forcefully scour the banks. There is no other route for the river to take. 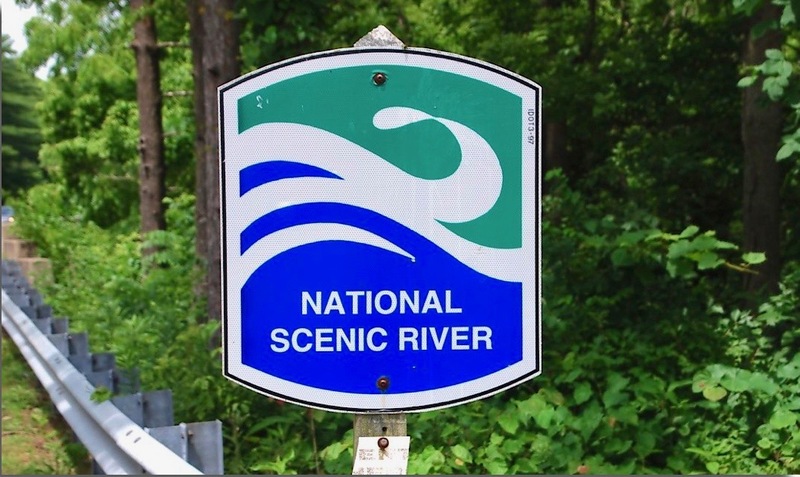 Not Compatible with the Wild and Scenic Rivers Act – Emergency riverbank stabilization was required in 2016, when the protective bank next to the New East Pit eroded 20 feet in just six years, threatening its stability. At that time, the National Park Service (NPS) explained in their Evaluation and Determination Letter that they believed the emergency stabilization was necessary “until such time as the fly ash storage ponds are removed.” The NPS concluded that the stabilization now in place is not consistent with Section 10(a) of the Wild and Scenic Rivers Act, and that the three coal ash pits present a water quality hazard and obstruction to the free-flowing conditions of the Middle Fork. They recommended removal and relocation of all of the coal ash. Dynegy hopes to be able to install the same design on up to 1,700 linear feet, upstream from the New East riverbank stabilization project. Has an Alternative for Moving the Ash been Considered? Dynegy submitted costed proposals for closing the ash pits in December 2017. All but one are variations on their proposal to cap the pits, stabilize the banks with rip-rap, and leave the ash in the floodplain of the Middle Fork. Their analysis for ash removal comes with a $192 million price tag. This is four to six times higher than costed options for their “cap and leave” proposals, but no details are provided to assess the reasonableness of the estimate—including the ultimate destination of the coal ash. In fact, no backup has been provided to the IEPA for any of Dynegy’s cost proposals. River advocates have been calling on Dynegy to move all or part of the coal ash away from the river to a lined, onsite location, away from the river. Recent conversations between Eco-Justice Collaborative and IEPA representatives indicate that the IEPA does not intend to ask Dynegy to pursue this option, even though its September 11, 2014 letter to Dynegy included the agency’s request to evaluate both feasibility and costs of relocating the ash on its property. If IEPA Won’t Hold Public Meetings or a Public Hearing, We Will! The IEPA said that they will not hold a public hearing. Eco-Justice Collaborative is now making plans to host a People’s Hearing in Vermilion County, later this spring. This forum will include testimony from experts on the risks of leaving the ash in place, and from residents affected by the TVA and Duke Energy coal ash spills. We will provide opportunities for the public to testify, and will invite Dynegy. Comments collected will be hand-delivered to the IEPA and Governor’s office. Read more on our website, including how to support the forum financially. Now is the time to get involved in the campaign to relocate Dynegy’s coal ash. Visit our website for campaign updates and a comprehensive FAQ document. Click on the ACT NOW tab to send customizable electronic letters to local and state officials, the Governor and IEPA Director, and the National Park Service. Use these letters to insist that the IEPA give due consideration to a plan that moves the ash from the floodplain of the Middle Fork onto its property. And be sure to attend the People’s Hearing, planned for April (date to be determined)! Residents of Vermilion County have a right to be informed about and comment on a decision that could leave them with the risks associated with a toxic waste dump in their backyard. A People’s Hearing will help provide an important bridge between a scientifically defined solution and the values and rights of those most affected. Eco-Justice Collaborative is a Champaign-based non-profit that uses education, advocacy and action to address urgent environmental issues, while integrating their work with ongoing struggles for social and economic justice.